Joyce Perrault, Indigenous Education Enhancement worker and author, will bringing students from Norma Rose Point School with Indigenous heritage to learn with students from University Hill Elementary School with Indigenous Heritage. Joyce will be sharing her Medicine Wheel teachings in the “We Are One” stone circle. 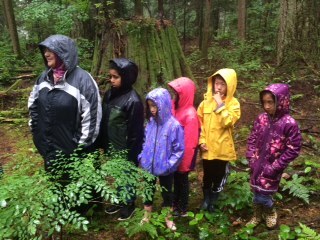 The Grade 4/5 student facilitators of this group worked with a teacher and a Musqueam Elder to learn about Indigenous plants in the Pacific Spirit Park. Two groups have been invited to the school to engage in one hour programs.